Get the Full Nashville Experience: Walk To Broadway + Much More. This 2 bedroom, 1.5 bathrooms with Cumberland River views sleeps 6 comfortably. Riverfront Condo has been newly renovated to give you THE perfect Nashville experience. A Jack Daniels barrel converted into a table provides guests the perfect opportunity to have a cocktail while looking at the Cumberland River. 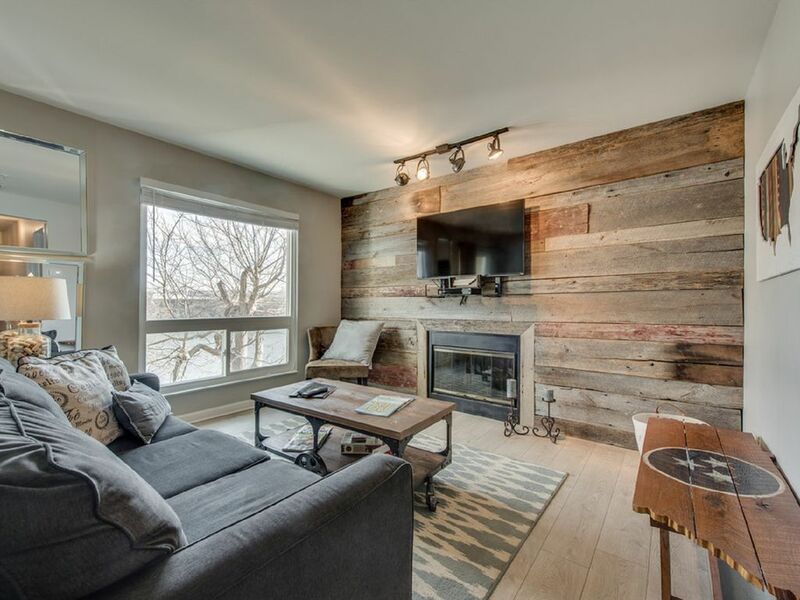 Put your feet up, watch TV on the reclaimed wood wall in the living room. Whether you're here to kick your boots up and party on Broadway or relax listening to the sound of the river, this is the PERFECT place for you! This Riverfront Condo will comfortably sleep six people. Sleep on air with any of the brand new mattresses, mattress toppers, and linens. The master has a large king bed, the guest room has a queen bed, and the living room couch pulls out into a queen bed. EVERYTHING in this unit is new to provide you with the most comfortable stay in Music City. While walking to Broadway is easy, the weather may not always cooperate, so an Uber drive is only $3-$5. Visit Acme Feed and Seed's rooftop bar, walk down to the famous Tootsies, or watch the Nashville Predators play in Bridgestone Arena. No matter what you choose to do in America's friendliest city, you will have a great time in your home away from home to ensure a comfortable stay! We are local RE/MAX realtors, Jim and Melissa Allen - and our business partner Tim Scott-- is a Farm Bureau insurance guru. Jim is a native Nashvillian. Melissa is from Chicago originally, but proudly calls Nashville home. Tim is a native Tennessean, former police officer and proud owner of a Labradoodle. Jim and Melissa now reside south of town in Brentwood where they are raising their two children and two rescue dogs. Nashville is 'Nowville.' We've always known that, but now the rest of the world is catching on. While we live, work, play all around town -- we wanted to own something right in the heart of the action. There is always something to do in and around Downtown Nashville -- concerts, Titans, Predators, Sounds, conventions, museums, festivals. We love our Music City and can't wait to share it with you! Location, location, location. Yes, that is why we fell in love with Riverfront Condos. Plus the gorgeous Cumberland views and the retro industrial vision we had for our unit. toilet, combination tub/shower, Jack-and-jill style, shared by both bedrooms. Walk to Nashville's famous Broadway for great bands, food, and drinks! This condo overlooks the beautiful Cumberland River. Stackable Washer & Dryer located in Master bedroom closest. For liability reasons, we ask that guests do not use the fireplace. The Smart TV allows access for guests to sync up their Pandora, Netflix, Hulu, etc. accounts. What do you do before and after your favorite team's game during the conference tournament? You watch even more basketball. Nashville is always a fun place to enjoy live music and good eats, but come on man it's basketball season. Yes, bars have TV however there are SportsCenter moments and late night games when you just want ESPN in your living room. What a disappointment that all we received were local channels. Had a great time, this location was perfect himebase for downtown spots! Clean, well furnished, quiet. Beds were comfortable. Exactly what we needed. Perfect homebase for seeing Nashville sites. Picked Nashville to spend the holidays with my young adult kids just because we had never been there! What a beautiful town. We walked easily from the condo to the downtown and district area. Great condo with fantastic river view. Very comfortable beds and furniture. We did some cooking and baking and unit needs upgraded pots and pans and would recommend a cutting board, cookie sheet and some glass Pyrex. Also, cable is very basic so bring an HDMI cord to watch the stuff you want to see. Would definitely stay again. Proximity to downtown coupled with the scenic river view was amazing. Loved the location and the property, only about a mile from Downtown Nashville. Loved the balcony overlooking the river and the wood burning fireplace made for incredible evenings after a busy day. Would recommend tools for the fireplace to assist with the maintenance of the fire. I would also recommend an upgrade on the cable/satellite provider so guests can watch some of their favorite channels. Property was equipped with smart TVs which definitely filled our nights by the fireplace watching Netflix and Hulu. Celebrated our 25th anniversary with my wife and we are looking forward to our next trip to Nashville and staying at this property again. Not the best neighborhood feel, had to uber most everywhere and taxi and food deliveries had a hard time finding the address, ... that's not the owners fault ... something wrong with the gps maps, ... but overall GREAT stay ! This newly renovated condo is situated right along the Cumberland River. The balcony provides the perfect place to kick back and have a cocktail. The outdoor is open during warmer months for those wanting to swim or work on their tan! Leave your car! Music City's popular Broadway is a leisurely walk away or a short Uber ride! When the Nashville Sounds are in season, take a walk to the ballpark! Bike path and Greenway adjacent to condo.